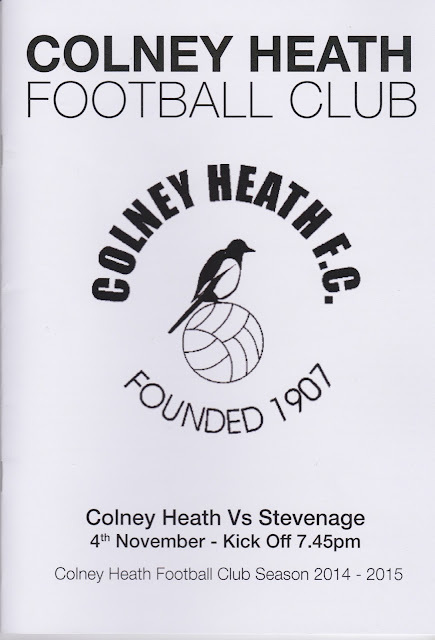 Colney Heath were founded in 1907 and played in local leagues for the early years of their history. It wasn't until the year 2000 that they joined the Spartan South Midlands League at Division 1 level, having previously been in the Hertfordshire League. They were always in the top 6 until they finally went up as Champions in 2006. Since then they have been ever-present in the Premier Division and had a best-ever finish of 3rd last season. In the FA Cup, they have reached the 1st Qualifying Round on a couple of occasions, while they had their best ever run in the FA Vase last season as they reached the FA Vase 3rd Round before going out to Brightlingsea Regent, who went on to win promotion to the Ryman League later that season. 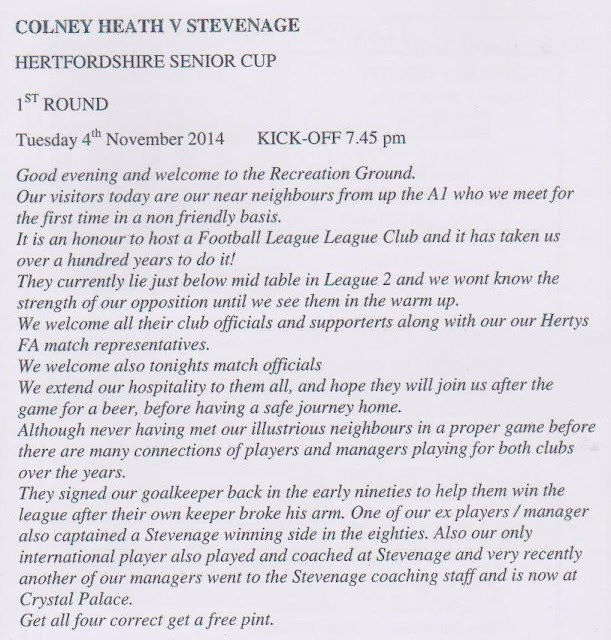 They won the Hertfordshire Senior Centenary Trophy 2 seasons in a row in 1996 and 1997. I had actually been to their ground to get pictures before. The Wycombe supporters coach stopped at a nearby pub on the way to Barnet, I went up to take a look and was quite impressed. 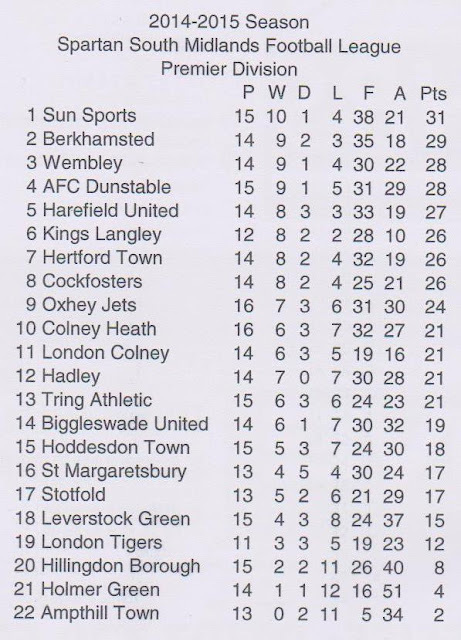 At the time of the game, they were in 10th place in the Spartan South Midlands Premier. I would be without Anwar again for this Tuesday game, so it was going to be a local game for me tonight to save on costs. I looked through the Non-League Paper and it boiled down to 2 choices. Ascot United v Holmer Green in the FA Vase, which had the advantage of being a few miles closer, and being in a better competition. 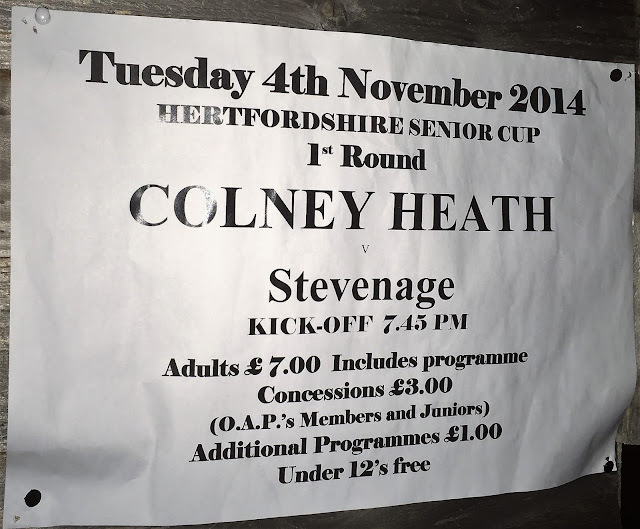 The other option was the game in the Herts Senior Cup between Colney Heath and Stevenage, which had the advantage of being in the Spartan South Midlands Premier, and being one of only 2 teams left that I needed to do to complete the league. It was also a shorter journey time. I decided to leave my decision till the Tuesday, when I plumped for the Colney Heath game, as the Stevenage Twitter said that they were sending a 'strong first team squad' to the game. It was really a game of 2 halves. In the first period, Stevenage had the bulk of the possession, but they didn't threaten as much as they should have. Colney Heath, on the other hand, defended very deep, which made going forward on the break very tricky. Stevenage took the lead on 15 minutes when Roarie Deacon turned in the box and fired home. They doubled the lead 4 minutes later, Tom Pett's shot going in off the post. The former Wealdstone midfielder was a target for Wycombe in the summer, but he ended up at Stevenage and looks to have the potential to become a decent football league player. The second half was a different story. Stevenage were down to 10 men the hour, Andy Bond getting his marching orders for pulling down the last man as he was clear on the keeper. The resulting free-kick was blasted high and wide, much to the amusement of the small gathering of visiting fans behind the goal. The Colney Heath number 5 did not see the funny side, however, bellowing back 'What's up with you, you bunch of f*cking retards'. The sending off gave the home side hope, and they pushed and pushed, culminating in a great long-range strike on 69 minutes, which flew in. 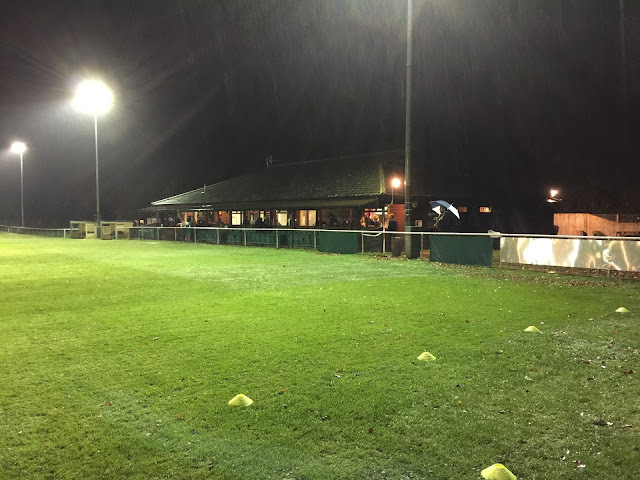 They had more chances to get back, but the game was put to bed on 80 minutes when Pett got his second, firing the ball home after the keeper parried the initial effort. It had been a pretty decent game, with Stevenage dominating, but then losing their way after the sending off. You won't see many better goals than the one they scored this season and they can be proud of their performance. I had a good drive home, getting in at 10.10. I typed up my blog, before watching TV in bed, going to sleep just after midnight. THE RECREATION GROUND is fairly standard for a ground at this level. There is just the one covered area, with around 80 seats and standing area for another 100 behind it. The rest of the ground is open. The clubhouse was nice and one of the better ones I have been in. They sold rolls and hot drinks as well as alcohol and soft drinks and had big screen TV's with Sky on. There is a pub in the Good Beer Guide that does food down the road, called The Crooked Billet if you have more time, but apart from that I can't recall much being around the area.